One year old, energy-efficient town home in Spring Lake is gorgeous with many upgrades. Property sits on a mews with easy access to walking path that leads throughout Celebration. Features two bedrooms, PLUS extra loft space for media room or office, and two and 1/2 baths. Two car spacious garage is connected to house, which is unusual in Spring Lake, and nice for keeping dry when coming in from work or town. Downstairs: Stainless appliances including a 36" french door counter-depth refrigerator, crown molding, Tahoe New Haven upgraded 42" solid wood maple espresso cabinets, 3x6 light grey glass subway tile back splash, Azul Paltino granite counter-tops in kitchen (and owner's bath), randomly staggered wood joint tile 6x24" Shaw glazed plank wood tile flooring throughout first floor. Upstairs: Upgraded carpet & padding throughout, large owners retreat with walk in closet, owners bath tile is stone porcelain Tesoro "ice" 20"x20".More: 15 SEER upgraded A/C, upgraded kitchen and bath faucets, under-mount sinks. Prewired for audio/video package. 5 1/4" baseboards, upgraded wall & bath tile surround. 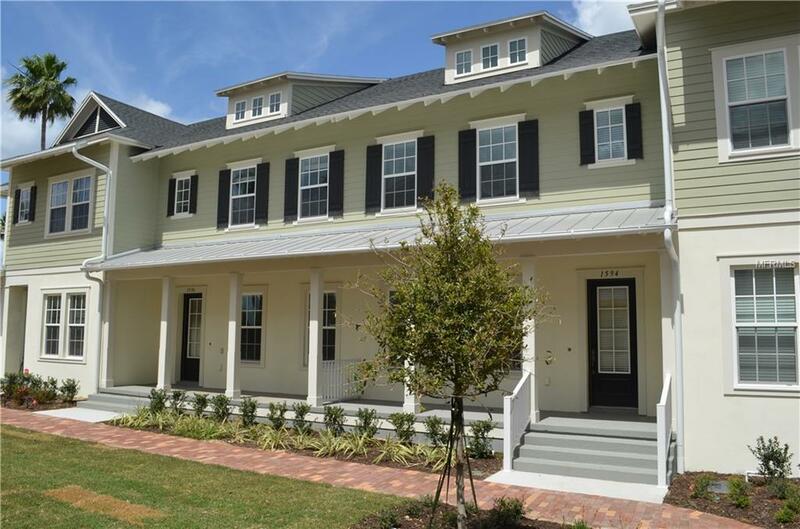 Fenced in patio courtyard and covered front porch facing mews.Lots more to enjoy in beautiful Celebration, Florida. It's a special place to live, and there are many wonderful programs and activities to pursue. Come and see your new home! Additional Lease Restrictions Confirm/Check With Town Hall On Any Leasing Restrictions 407-566-1200. Pet Restrictions Confirm/Check With Town Hall On Any Pet Restrictions 407-566-1200. Listing provided courtesy of New Urban Real Estate.